The Indo-Russian cooperation is becoming one of the cornerstones on which the new world order is being established, which challenges any attempt to preserve a unipolar world order. As the year 2014 is passing into pages of history it may be worthwhile to take a stock of India-Russia relations in the year. It is difficult to detail all the bilateral announcements, declarations and agreements of the year, but it is certainly possible to identify the broad patterns and whether these patterns indicate a healthy status of the partnership or not. One of the most significant markers of the partnership in 2014 is India’s consistent position on the Ukrainian crisis. India has expressed resilience in understanding Russia’s sensitivity in the crisis. Along with its trusted partner, it has opposed any unilateral measures or sanctions to put pressure on Russia. Whether bilateral forums or multilateral forums like BRICS, India and Russia took a unified position that the conflict needs to be resolved through peaceful means, through dialogue and reconciliation. When a resolution was initiated in the United Nations General Assembly that apparently contradicted Russia’s position on Ukraine, India decided to abstain than supporting the resolution. Another visible sign in this regard is as a counter measure to the Western sanctions Russia banned import of meat from the West, and trusted its allies like India for the import. Now, India will be supplying buffalo meat to India. Both the countries have also explored options to continue bilateral trade in local currencies like rupee-rouble. Despite pressures from the US, the 15th bilateral summit in December 2014 went unhindered with both the countries emphasizing on the ‘special, privileged and strategic’ partnership. It might have surprised some of the leaders of the Western countries that the Crimean leader Sergey Aksyonov accompanied the Russian President, Vladimir Putin, and held talks with Indian businessmen. This has sent a clear message. India and Russia will conduct their relations on their own terms. Bilateral relations lose much of its base when there is a lack of friendly relations between people. On this account India and Russia have scored high in 2014. India eased visa restrictions on Russian travelers. Under the new rules there are provisions for e-visa and visa on arrival. Russia has also opened new Russian visa application centres in the four metropolises of India to expedite visa applications of Indian citizens. In defence and economic relations, the year set many mile stones. In June 2014, Indian Prime Minister, Narendra Modi dedicated the Russian built aircraft carrier INS Vikramaditya to the nation in the naval port of Goa. Modi called the day “important day for our nation.” As an emerging power with rising aspirations, and with a troubled neighborhood, India’s defence requirements have risen steadfastly. And Russia has become a suitable match to meet the requirements. Whether it is export of jointly built supersonic cruise missile BrahMos to third countries, or fifth generation fighter aircrafts, Sukhoi Superjet-100, MS-21passengers aircraft, 124 T-90 tanks or leasing of a second submarine for India, the year has witnessed considerable dialogue. This is certainly a good sign. It shows the seriousness of the policy makers of both the countries to cultivate deep the relations and to sort out the differences. The year has witnessed a considerable number of bilateral visits by top officials. The role of Russian Deputy Prime Minister, Dmitry Rogozin and his emphasis on taking bilateral relations to a new level during his visits to India needs to be commended. One of the major issues in bilateral relations is most of the economic deals are taking place at government to government (G to G) level. The year 2014 has witnessed serious introspection and analysis to transform this G to G level gradually into government to private business (G to B) level, and then into B to B level. There are already constructive dialogue between the Russian Direct Investment Fund and the Confederation of Indian Industry in this regard. There are some agreements such as between Russian Roseneft and Indian ISAR for the supply of crude oil, Russia Dauria Aerospace and Indian Aniara for design and production of telecommunication satellites, to name a few. Some of the areas of cooperation that have received focus in 2014 include diamond processing, space cooperation, and oil and gas. 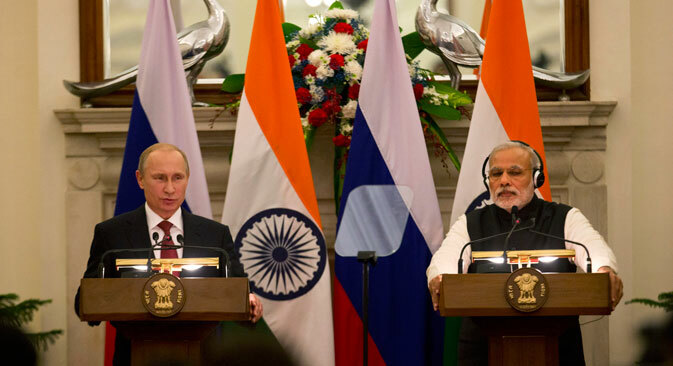 Prime Minister Modi and President Putin graced the World Diamond Conference in December 2014. India’s Trade and Commerce Minister proudly declared on the occasion that out of every 15 diamonds in the world, 14 are cut and processed in India. Both the countries also focused on diversifying the relations to sectors beyond defence. In this diversification move, energy has trumped. There are talks to build pipeline, which Russian Ambassador to India Alexander Kadakin termed ‘historic’ if realized, connecting Russia and India. Russia built nuclear power plants in India is another major achievement. Despite hurdles, the Kudankulam plant will be operationalised soon. There are also talks on building transport links called North-South corridor, and also reviving the Silk Road through the vast Eurasian landmass, with involvement of third countries. There are also talks of India signing a comprehensive economic partnership agreement with Russia led Customs Union. India and Russia have also moved towards Asia-Pacific, and turning the global focus from a Western-centric order to a multipolar order. In this regard, the establishment of BRICS Bank, officially termed New Development Bank, in July 2014 must need emphasis. The bank is likely to be an emerging alternative to the existing global financial system. Whether it is BRICS, SCO, G-20 or RIC, India and Russia have played major roles to engender a global debate not dominated by any particular ‘ism.’ Russia also pledged to support India’s candidature for full membership of the SCO. Russia’s support to India’s political and strategic aspirations is well known. At political and strategic levels, the relations can be termed robust. The year 2014 further corroborated this. Both the countries emphasized on a religious extremist-free world whether in Kashmir or Chechnya, or in Syria, Iraq or Afghanistan. They further emphasized on a peaceful transition in Afghanistan. The Afghan leadership is positively inclined to boost relations with India and Russia, and there are also possibilities for India and Russia developing and training forces in the war-torn country. The year 2015 is promising. As the political dispensations in New Delhi and Moscow will continue to be same next year, it will be less difficult to finalise deals.